This page is written by the game's inventor, Adrian Alvarez de la Campa. This variant is inspired by "breakout" style video games like Arkanoid. The idea is simple: there is a zone of neutral blocks that pieces must break through by capturing. The only other difference from orthodox chess is that there are only two Pawns per side. The squares in the middle four ranks (outlined in white above) are "blocks". Blocks can be considered neutral, unmovable pieces that block piece movement until they are removed by capture. 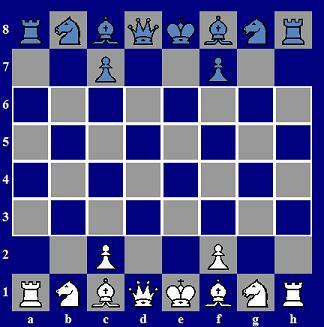 Note that at the outset Pawns cannot move forward, but can only move diagonally to capture blocks. Can I assume that knights are unaffected by the blocks, as a piece can stay on the block it captures? Not that I have a problem with this, but it would make knights extremely useful in the opening as they already are, correct?